An article by Jen Viegas on seeker.com - Neanderthal's Eye for Bling Revealed by Unique Rock Stashed in Cave - reports on an artefact that caught the eye of a Neanderthal at least 130,000 years ago. Both sides of a limestone rock collected by a Neanderthal 130,000 years ago. The arrows point to an area where the striation-causing inclusions are especially large. Image: David Frayer, University of Kansas. 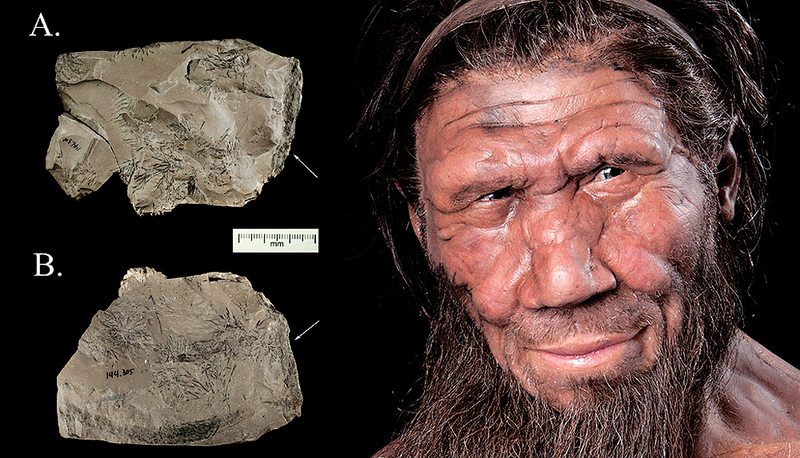 In what is now Croatia, a Neanderthal picked up a fragment of limestone and placed it in a cave. The discovery, reported in the journal Comptes Rendus Palevol, provides some of the earliest known evidence that early humans collected rock artefacts, suggesting symbolic-like capacities normally associated with modern humans. Co-author David Frayer, a professor emeritus of anthropology from the University of Kansas, and lead author Davorka Radovčić of the Croatian Natural History Museum in Zagreb, and their team, analyzed the rock, which was found at a site called Krapina. The object is roughly five inches long, four inches high and about a half-inch thick. Made of brown limestone, the rock features natural dark striations and a reddish hue on its corners. When wet, the stripes and redness become even more pronounced. Frayer states that the piece was never flaked and was not used as a tool, but collected as a curiosity. It is believed to have been picked up just over a mile north of Krapina, where there are known outcroppings of this type of stone, or the Kraponica stream could have transported it closer to the cave site. Neanderthals also collected interesting-looking teeth, shells and bird feathers, which they modified to wear as jewelry. Frayer states that he and his team are still analyzing finds excavated at Krapina, and that there is more to come from this important site.